bbc.comIn 1986 I was allowed to stay up late to watch the end of the Masters. I knew little about the tournament, other than that my dad was a fan, but he was allowing me to be up way beyond my bedtime so I was all in.It proved a decent introduction. Jack Nicklaus destroyed Greg Norman by taking just 30 shots for the last nine holes to win a record sixth Green Jacket. The roars were loud, the colours vibrant, water everywhere. The roars got louder. The television commentary was sublime. I was hooked. 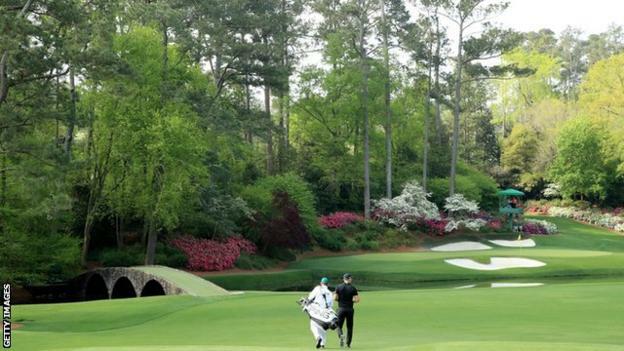 It's taken 33 years to visit Augusta National for the first time. Here are five reasons it's been on my bucket list. The Masters is about so much more than the four days that decide the winner.The tournament is neatly packaged between the honorary starter's drive on Thursday and the presentation of the Green Jacket in the Butler Cabin on Sunday.But even before the opening tee shot, there is Tuesday's Champions Dinner and Wednesday's par-three contest to lighten the mood.The menu for the Champions Dinner is created by the previous year's winner. In 1997, England's Nick Faldo chose tomato soup followed by fish and chips. In 2012, Charl Schwartzel requested a South African braai - a type of barbecue - with monkey gland sauce.Defending champion Patrick Reed has opted for the safer option of steak, mac and cheese, and creamed vegetables. "I'm definitely going to fatten everyone up," said Reed, who has included grilled chicken and seafood "to try to please the 30-something men".The par-three contest has a relaxed air, with players' partners, children and friends donning the caddies' white boiler suits and allowed to hit tee shots and putts.Beware the 'par-three curse' though - in the 58 years it has been contested, nobody has won it and then gone on to secure the Green Jacket.All the while the patrons - always patrons, never spectators - move serenely around the course. They have to, or they risk being chucked out.The rules are simple. No running. No shouting. No mobile phones. And if you have a Masters-approved chair, you can plonk it in your favourite place, wander off for the day and return safe in the knowledge nobody will have touched it.The patrons are handsomely rewarded for their good behaviour. Pimento cheese sandwiches - a local favourite - set them back a little over £1, while a local beer is not much over a couple of quid.And then there's big John Daly. He's becoming something of a Masters institution. The 1995 Open champion is in Augusta again this year, but not to play. He has set up his van in a parking lot just round the corner from the entrance, selling memorabilia. All majors have their fair share of memorable shots, but what helps the Masters feel more special is the fact it is in the same place each year so certain shots and pin positions become imprinted in our minds.In the video below we have compiled our top 10, although there have been so many to choose from we're bound to have missed one or two. And even if you can't view the video you can still cast your vote for your favourite from our list. One shot we've not been able to include is 1935 champion Gene Sarazen's "shot heard around the world". It's arguably the greatest of them all because it helped catapult the infant Masters into the mainstream. But because there was no television footage, his albatross two from 230 yards on the par-five 15th will forever remain a mystery to all but those who were there. There is an old saying that the Masters doesn't really start until the players hit the back nine in the final round.So many championships have been won and lost on some of the most storied holes in golf. I've watched them all, and memories flood back as I see the shots for real.Faldo won his third Green Jacket in 1996 when Norman bogeyed nine, 10 and 11 before finding water on 12 as a six-shot lead turned into a five-shot deficit.American Jordan Spieth, who birdied four successive holes to lead by five with nine to play, looked nailed on to retain his title in 2016 but dropped shots at 10 and 11 and hit two balls into the water at 12 as England's Danny Willett won.Then there was Rory McIlroy in 2011. The Northern Irishman started the final day with a four-shot lead but dropped six shots in three holes from the 10th, including taking four putts from 20 feet on the 12th. Schwartzel went on to win. Woods claimed the first of his 14 majors at Augusta in 1997 - he has since won the event a further three timesThere are so many to go at. Will McIlroy finally complete the career Grand Slam of all four majors? He has the game for Augusta National, with top-10 finishes in his previous five Masters, and he's in form having won the Players Championship last month.Will England's world number one Justin Rose break his Masters duck after a couple of runners-up spots in recent years? Is his compatriot Tommy Fleetwood, who has twice gone close at the US Open, ready to win his first major?Of the Americans it's impossible to ignore Woods. At 43, he is back up to 12 in the world rankings, the highest-ranked player in the field to have won here, albeit the last of his four triumphs was 14 years ago. Nicklaus won his last Masters 11 years after winning his fifth at the age of 46.Spieth may have dropped to 33 in the world rankings but the 25-year-old 2015 champion also has two seconds and a third in his five appearances.Rickie Fowler, who has finished runner-up in three of the four majors, and third at the 2014 US PGA Championship, is overdue a victory. The 30-year-old was 12 under for his final two rounds last year to push Reed close.The truth is I could run through more than half the field and make a claim for them pulling on the Green Jacket on Sunday.I'd love to see McIlroy complete his Slam, or Woods end his major drought, but there's little room for sentimentality in sport and I think there will be an English Rose overshadowing the azaleas on Sunday.